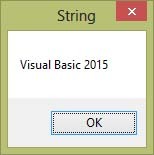 In Visual Basic 2015, a string is a single unit of data that made up of a series of characters that includes letters, digits, alphanumeric symbols(@,#,$,%,^,&,*, etc) and more. It is treated as the String data type and therefore it is non-numeric in nature, though it might consist of numbers. 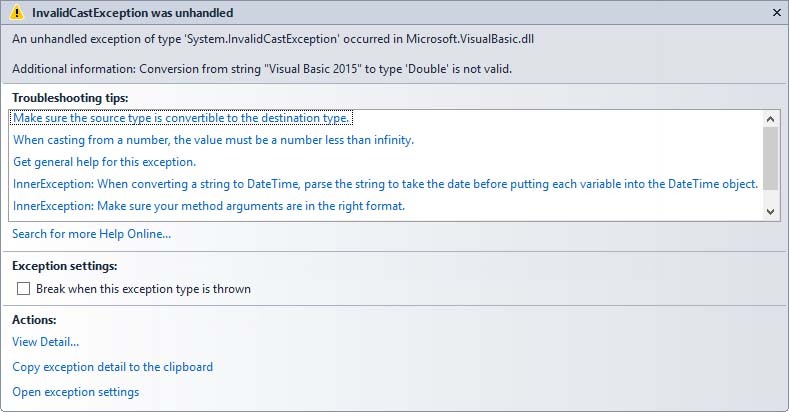 Everyday life examples of strings are names, addresses, gender, cities, book titles, phone numbers, email addresses and more.In Visual Basic 2015, you can manipulate strings by writing code to process characters like sentences, words, text , ” ,alphanumeric characters and more. 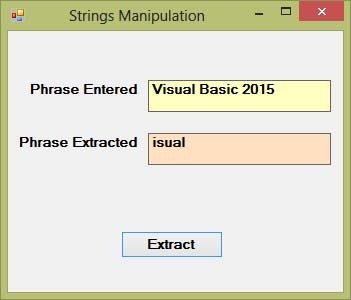 Strings manipulation is best illustrated in the area of word processing that deals with text editing. The line str = str1 + str2 + str3 can be replaced by str = str1 & str2 & str3 and produces the same output. However, if one of the variables is declared as numeric data type, you cannot use the + sign, you can only use the & sign. This code will produce an error because of data mismatch. The error message appears as shown in Figure 12.2. 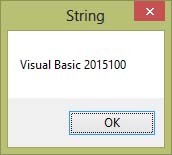 A function is similar to a normal procedure but the main purpose of the function is to accept a certain input and return a value which is passed on to the main program to finish the execution.There are numerous string manipulation functions that are built into Visual Basic 2015. The above program returns four rightmost characters of the phrase entered into the textbox. phrase is the string from which a part of the text is to be retrieved. position is the starting position of the phrase from which the retrieving process begins. n is the number of characters to retrieve. * In this example, when the user clicks the button, an input box will pop up prompting the user to enter a phrase. 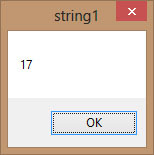 After a phrase is entered and the OK button is pressed, the label will show the extracted text starting from position 2 of the phrase and the number of characters extracted is 6. *The function returns a numeric value.